Stanhopea is an amazing genus of orchids from America. These sympodial orchids have grandiose flowers – for instance, Stanhopea tigrina (synonym Stanhopea nigroviolacea) has flowers up to 8 inch wide (up to 20 cm). 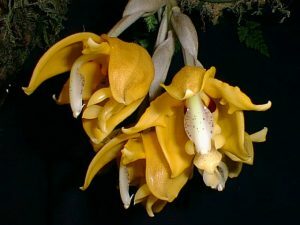 Their flowers are also extremely fragrant (fragrance of confectionery could be sensed for very long distances, some Stanhopea growers hung their Stanhopeas outside of a house when they flower, the odor is so strong). A cool feature of these orchids is that their flowers are located upside down – so they are never resupinated but just hang down the orchid. That’s why Stanhopea often is called upside-down orchid. Only one sad moment of Stahopea is that their extremely lovely flowers don’t last long. 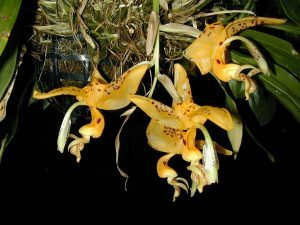 What’s about stanhopea orchid care? Stanhopea orchids are epiphytes and occasionally terrestrials, they need open well-drained substrate of medium bark, cocoa chips, and some sphagnum, they are grown within hanged baskets with trellis bottom, solid bottom baskets and pots are not suitable for Stanhopea growing. Giving the fact that their flowers are located vertically beside the plants, Stanhopea’s buds have to make their way out the basket, so you have to make openings in the bottom, otherwise, buds will not break out, rot and plant can die. Like many other orchids, Stanhopea likes when night temperature is several (up to 15-20) degrees lower. Such lowering of night temperature is required for a development of plant flowering.